Tuesday, the towering American news anchor Charlie Rose sat folded into an armchair across from U.S. Supreme Court justice Ruth Bader Ginsburg. More than once the interviewer threw out questions rapid-fire, and was met with measured silence from his tiny interlocutor. The two spoke for an hour and a half at the 92Y in New York City, about Ginsburg’s cases, views, and late husband. Ginsburg, the second female judge named to the highest American court, is a feminist icon, and her conversation with Rose rarely strayed far from that fact. More than once the justice emphasized her intolerance for the idea that a woman might not be afforded a life any less than a man, in politics or the workplace, legally or socially. Early in the evening, the conversation turned toward the 2016 presidential election, for which the country had its first major female contender. “Do you think sexism played a role in that campaign?” asked Rose. 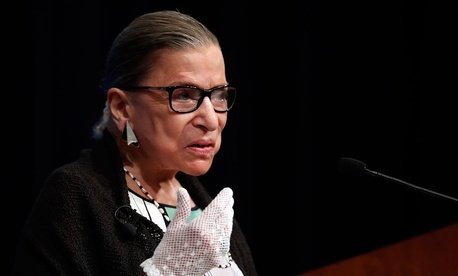 After pausing to repeat the question, Ginsburg answered in her low, gravely, Brooklyn-tinged voice, “I have no doubt that it did.” Rose asked if the justice thought this was the decisive difference, that if Hillary Clinton had been a man she would have won. “There were so many things that might have been decisive but that was a major, major factor,” said Ginsburg. We’ve talked a lot about your voice tonight…. We’ve talked a lot recently about voices, especially female voices, being irritating, or being interrupted, or being too shrill, or how to tone down your voice, or how to be a woman in a profession that’s dominated by men…. Do you have any strategic advice for those of us who are trying to convey our voices? Ginsburg said that one op-ed writer tried to explain the incident by characterizing her as a “fast talking Jew from New York” and O’Connor as a “laid back girl of the golden west,” even though Ginsburg speaks far more slowly. Ginsburg also said that when the two worked together, lawyers repeatedly referred to her as “justice O’Connor,” an indicator of sexism that Ginsburg has been vocal about. “They heard a woman’s voice. Although we don’t speak alike, we don’t look alike, I was called justice O’Connor,” she said last night. Indeed, O’Connor is much taller than Ginsburg, has white hair, doesn’t wear glasses–none of which matters, actually; they’re just different people. That, it seemed, was Ginsburg’s point and her advice to women: Continue being yourself, and the world will see that women aren’t interchangeable.